It has been a while since I have really blogged our journey with biomed. Launching my own business, Real Food Mum, has been exhilarating and has taken a lot of my writing time as our client schedule and content creation have taken priority. 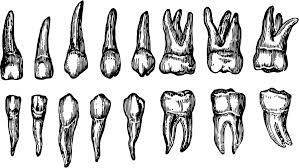 At the end of May, beginning of June, we were referred to the Orthodontist for a consultation. At that time, he was less worried about the reason for our original referral which was jaw formation. Instead, he was focused on an issue uncovered by their 3D xray. My son's canines had not fallen out like the regular dentist thought. The adult teeth were coming in and the baby teeth showed no signs of the root dissolving anytime soon. His recommendation was to schedule extractions by the end of summer. Yikes! That would mean anesthesia. My son's detoxification pathways have opened so nicely partly due to all of the biomed we've done, methylation support and certainly the use of the IonCleanse footbath detox system. But still, the last thing I would willingly do is have to put him through the exposure as well as the pain of extraction. Certainly to avoid larger problems down the road, I would do what I need to do. But, I figured I had a few months to tackle this myself. I did some research on local practitioners and went to see Dr. Rich Petke who had been treating my friend's whole family for years. He was fabulous and sadly, getting ready to move to Washington State. We maximized our time left with him here and we did homeopathy and craniosacral. I can't even really go into what happened during my son's craniosacral treatments. I believe he released some birth trauma even. If you haven't looked into it, I highly recommend you do. As we started to implement homeopathy, a modality I am very familiar with, it managed to astound me yet again. 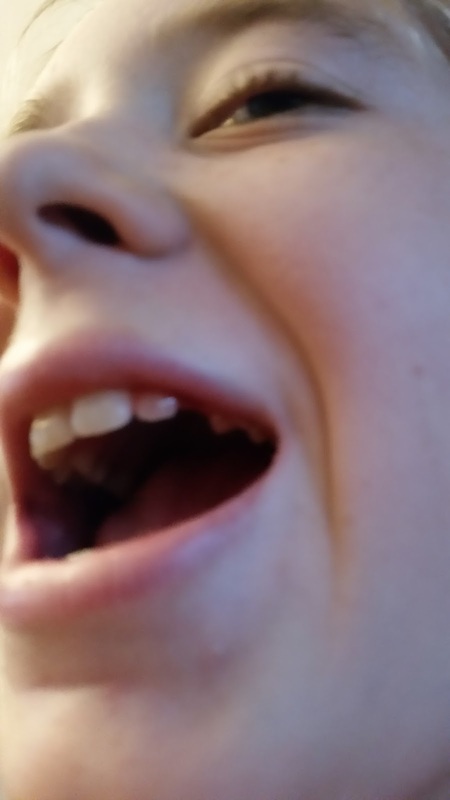 After the first dose my son reported a loose tooth. Seriously. He had no teeth loose at the time, none. 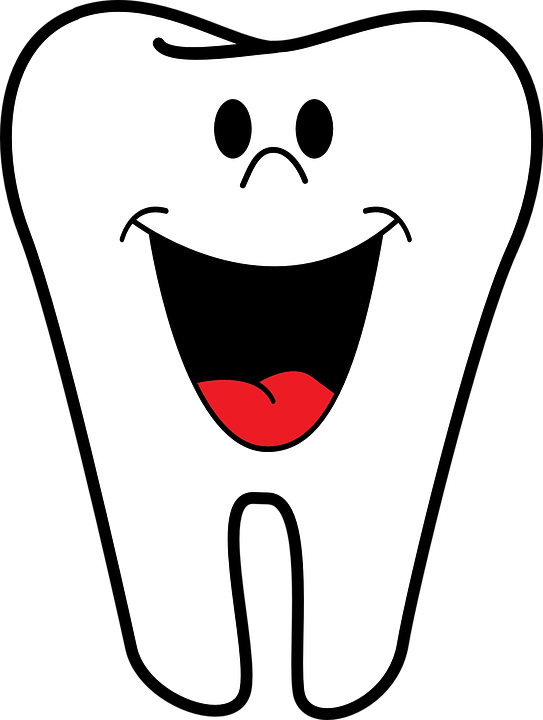 We had just had a dental checkup and that was what necessitated the orthodontia referral. His teeth had been thoroughly checked very recently. The boy has lost a tooth a month since (the total is 5 for those keeping score at home!) We dosed about twice a week, sometimes less. If there had been much time between the previous dose due to a vacation or forgetfulness, almost inevitably I would hear "Mom, I have another loose tooth" immediately following a dose. But, none were those canines! We just went back to the dentist for another cleaning and checkup. I had given him a dose of his remedy and he told me another tooth felt loose. At the dentist, I asked them to confirm which tooth was loose, it was his canine!! At dinner tonight he lost his first canine tooth! I know, not the best photo but you can see the gap there. Can you see his smile in this picture? Chalk up another win for homeopathy, this time saving us from 2 teeth needing to be extracted. Real Food Mum hosts Moms Across America in Flagstaff! If you care about the impact of glyphosate-based herbicides and GMOs on health and you are in Flagstaff, you won't want to miss this FREE talk we are having. Join Real Food Mum Co-Founders Elaine Copeland and Terri Hirning as we welcome Moms Across America Founder, Zen Honeycutt, to Flagstaff. This is important dialogue to have regarding the health of our bodies and our environment. Please RSVP via our Facebook invite here so we ensure we have a seat for you! Please share this event and let's show Zen how many people care about toxins and GMOs in our food supply we have in our awesome mountain town! Yesterday my friend Tyler Dahm asked a great question in a Facebook group, what does autism recovery look like to us? It is something I have blogged about many times, I think I even did a Thinking Moms Revolution blog on the topic. It can be touchy. There are those who may say if your child still needs a special diet or supplements, they are not "recovered". You could find a million ways someone may justify that a child is not recovered. I say, look at where they are and see them where they can be and then tell me. There may still be stims or scripting, or social challenges. This is real life and if we pause a moment and realize just what these individuals have overcome, we stand amazed at their capacity to heal and grow despite their underlying metabolic challenges. So, I had a few minutes before heading out the door so I chose to ask my son himself. He is the one recovered from autism. So here is his perspective, in his own words. It is always hard to tell people where we came from. My son was largely non-verbal for years. He could not sleep more than a few hours per night and no more than 2 hours at any one time. He screamed, a lot. He would sit on the floor and spin Tupperware lids rather that interact. I would call his name and get no response, to the point where we thought he might have hearing issues. I found this video from early in our biomedical intervention years. In this video my son is almost 5 years old (just 3 months shy of turning 5). You will notice he is still in pull ups. He carried around a fake lemon. He started out obsessing on a real lemon but you can imagine what happens when someone carries around a real lemon 24/7. Notice that he never responds to a request or question of mine. He does his own thing and does not even appear to hear what I have to say. And then check out my daughter, who was 1 1/2 at the time. She responds when I speak to her, says HI when I ask her to. The difference is huge and heartbreaking. I think seeing where a person came from is just as important of seeing where they are now. I have met readers of my blog in real life and they think I must be talking about a child other than Matthew when they meet him. Especially if they have read earlier blog entries. It is hard to believe that he is the same child. But, I need families to know it IS possible. We found what worked for him after years of trying, and trying, and trying. We trusted our gut. We work with a physician who works with us. Never give up. Recovery is out there! I am thrilled to announce that earlier this year my partner and I launched a company called Real Food Mum! What is Real Food Mum? We provide support, recipes, private and group consultations, pantry clean outs and other services to support families looking to transition to a real food diet. Eating healthy can be easy and affordable, believe me, I do it! The journey recovering my son from autism has changed me profoundly. Without it, I would not be the person I am today nor would I have the tools to support other families (with or without autism) in eating as close to nature as possible. My passion is helping others change their lives through diet and nutrition. And, my partner and I can show you how to do so on a budget, with a busy schedule and juggling a family. We have you covered! Join us in our next group program, programs start each month, or book a private consultation to go over your goals and make changes in your diet. If you want to learn more about lab testing from a parent's perspective, please tune in for my FREE webinar I am doing for The Great Plains Laboratory on December 16th. To register, click here. After a lovely bout of stomach flu raced its way through our house, I started noticing some of those tell tale signs of clostridia in my son. Short fuse, no patience, high frustration level, elevated anger response, yes something was going on. We sent in Organic Acids Test (OAT) and the brand new GPL-TOX tests for us all. More on the TOX test in a later blog. Well, the results were as expected, elevated HPHPA, a sign of clostridia. Luckily we know what to do and are on that path but I started to wonder, what had happened? We had a good year and a half since we had any clostridia / yeast flares. And then it dawned on me, the stomach flu. Nothing disrupts the microbiome quite like that little gem. And while we started immediately back on probiotics, the damage had been done. Had I not done testing, I would not have known our current probiotic regime was woefully inadequate and needed bumping. Yes, the behavior symptoms told me something was going on but my lab test really validated that and drove my treatment protocol. This is a great reminder that lab testing is not a "one and done" thing. If you don't test periodically, how do you really know what is going on? And speaking of testing, I will be doing a webinar for The Great Plains Laboratory on lab testing from a parent's perspective December 16th. I will post a link to register (it will be FREE) and feel free to post questions or message me if you have things you would like to see covered. Parents are in a unique position to really use lab testing to make changes that can be impactful for their child's, and their own, health. But, lab testing can be confusing and I would like to help make it less so. So, again, remember that illness can severely disrupt the microbiome and often after an illness can be a good time to retest, especially something like an OAT when you want to get a good assessment of gut function. I know my blog readers tend to want to know about good products that are organic and toxin free. I had the opportunity to review Vitamin C Moisturizer from Made From Earth. I was looking forward to this because it is all organic and made without the toxic ingredients that we tried and avoid. It is important for me and my family to use organic and non toxic product where possible. This moisturizer is organic and filled with high quality oils and ingredients designed to nourish skin. I tried it and enjoyed the light, smooth feeling. It was pleasant smelling despite having no artificial fragrances. It made my skin feel supple and smooth. I look forward to seeing how my skin responds to repeated use. Their website can be found here to learn more about #vitamincmadefromearthorganic. New Autism Mastery Course Start Date! Are you a parent of a child with autism and you want to learn about biomedical interventions that have been helpful for many children? Do you want to flatten out your learning curve? If you are motivated to get a fast-tracked approach to learning the ins and outs of biomed then this course is for you! My son has been a patient of Dr. Woeller's since shortly after his diagnosis at 4 years old. My son is 12 and considered recovered from autism and Dr. Woeller was our guide on this journey. His experience, insight, willingness to work with parents as a team, and his drive to keep learning the latest research and treatment options. His next Autism Mastery Course is launching soon. Don't miss out. And if you know of a practitioner wanting to learn more about the treatment of autism, this would be perfect for them as well. When Dr. Woeller launched his Autism Mastery Course last summer, it was a huge success, and many people have been asking when it will be available again. The next course start date is November 9, 2015. The Integrative Medicine Academy’s Autism Mastery Course for physicians and other health care practitioners is an extremely comprehensive course, designed for practitioners and parents who really want to know the science and protocols of treating autism using integrative and functional medicine. Dr. Kurt Woeller, renowned autism treatment specialist, incorporates his 17+ years of clinical practice into a program that could be understood and implemented in a reasonable time frame. The course itself is timely, as autism rates are growing each year, and there simply aren’t enough knowledgable health practitioners to help! This online course features clinically relevant, practical, and time efficient material for any health practitioner currently working with the special needs community or for those who want to gain knowledge about how to help this underserved population of people. To help families struggling with the complexities of autism, Dr. Woeller has created an online, 16 week course that will provide a depth of knowledge regarding biomedical intervention for autism-spectrum disorders that would normally take years of training and practice to obtain. This course will flatten out the learning curve for you to be able to understand and treat autism. While Autism Mastery was created with the health care practitioner in mind, we know that “autism parents” are some of the most educated and studious people out there, so we will have spots available for dedicated parents as well. This course is for anyone looking to implement biomedical intervention into their practices (or homes) and take their knowledge of integrative health concepts to a deeper level in helping these children. We need more educated and knowledgable parents and health practitioners helping kids - no matter where they are in the world. “This course has been great!! Every week I am adding something more to our practice because of this class. Our practice initially worked with neurofeedback and behavioral health, but since starting the course, we have certainly implemented the integrative health model. Please join us to learn more about the Autism Mastery Course and how integrative medicine for Autism is so crucial in fighting this growing epidemic. 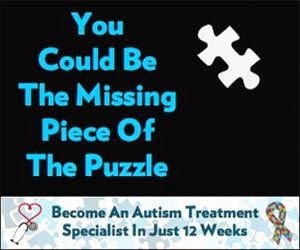 Please go to http://AutismMasteryCourse.com more information or to enroll in the course. I had the opportunity to try Organic Matcha from Enzo. It was delicious! The smooth consistency of the powder mixed well in warm water. I had a much more concentrated drink than I would with just a tea bag. I also added it to my smoothies. I love the antioxidant properties in green tea and this provides that with ease. I also liked the taste and texture of Enzo Organic Matcha. 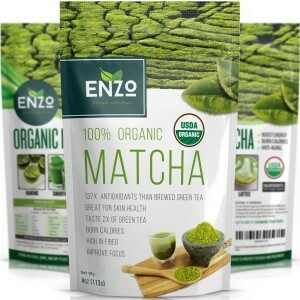 If you are looking for an easy to use, pleasant tasting matcha powder, I would recommend Enzo! Find them at the website enzomatcha.com or on Amazon here. For my son's 12th birthday, he wanted a Percy Jackson / Greek God themed party. He LOVES Greek Mythology, I mean loves it. There wasn't a lot out there, a couple of things on Pinterest so I had to wing it a little. First up was a chalkboard drawing for his birthday. One of the things his previous teacher did was a chalkboard drawing for his birthday. He loved that so I wanted to continue that in our Waldorf Homeschool. I worked off of the picture of Zeus in one of our Greek Mythology books. I am still very much working on my artistic skills (did I mention we are NEW to Waldorf homeschooling??) so be gentle. Since Percy Jackson's favorite color is blue, his mom gives him a blue birthday party so that was pretty easy. Blue streamers, blue balloons, I found some gold star balloons which fit well. We cut out large yellow thunderbolts out of posterboard and smaller ones using my Cricut for the cupcakes. I also found these cute ceremonial cups at the Dollar Store that looked Greek to use on top of some cupcakes. The decor and presents are ready! Paleo cupcakes, gluten, dairy, and soy free. These are coconut flour based and to get the Percy Jackson flare, I made a blueberry puree and it colored them nicely. Paleo, gluten, dairy, and soy free pancakes. These are almond flour based and again to color them blue I made blueberry puree. I put some in a baggie, cut off the end and was able to do a number 12 and a lightening bolt. We served them up on our special celebration plate and he loved it! Wow, it is only in having my son's birthday party in September that I am realizing I never posted about my daughter's birthday party in January. Yeah, to say we've been busy around here is a huge understatement! Both of my children have gotten to the point where this year they are choosing just to have a family party. But, that doesn't mean we don't decorate and have FUN! So, for anyone else wanting to do a Harry Potter themed birthday party, I hope these ideas can be of use! Mandrake Cupcakes! Take babies meant to be baked into cakes (think Kings Cake for Mardi Gras) and hot glue a bit of fake plants on top and tuck into a cupcake. This one is a paleo version, gluten, dairy and soy free with Almond Flour. I bought little pots and just inserted them with the cupcake liner they were baked in. I took one cupcake and crumbled it to give it the look of dirt in the pot. I was able to serve healthier versions of foods and treats without missing out on anything. And, finds like the Target Dollar Spot (chalkboard stickers) and the Dollar Store for the trays and pots made it economical as well. Celebrations don't have to be limiting when you have food allergies and intolerances. Some additional creativity will take you far once you get the hang of it! Why Should Parents of Children with Autism Take Dr. Woeller's Autism Mastery Course? We are in a time of ever increasing treatment options, but where do you start? As a parent, the journey of autism recovery can be a long one. Do you want to take more control over your child's healing and treatment? Do you want to better understand the options available? Do you have limited time and need this at your own pace?? I said yes to every one of these and that is why I am taking Dr. Woeller's Autism Mastery Course! Need more convincing? Check out the 5 reasons below that YOU should take his course too. #1 – Decrease months and years of frustration trying to figure out things on your own by becoming empowered through self-education about the tremendous potential to help your child. #2 – Get immediate help for your questions through the ‘participant’ forum and have access to cutting edge information right from your computer. #3 – Learn to prioritize which laboratory tests are most important for your child and why, what the various markers mean from the tests that you do, and prioritize what interventions to focus on as top priority items. #4 – Learn to troubleshoot common behavioral and biomedical challenges often seen in integrative health practice. Learn to devise strategies to improve the best outcome for your child. #5 – Obtain doctor designed information for your own education and to share with your child’s personal medical professional to assist in their treatment. Autism recovery. Such a loaded term, I am not exactly sure why. Would you say "What do you mean you are treating your child's diabetes with insulin, can't you just ACCEPT them as they are?" That is how I feel about the disorder called autism. I never presume to know anything about anyone else's child and their medical history unless I am looking at their lab results or speaking with a knowledgeable caregiver about their health history. But, I know my own child's story quite well. I have volumes of files, psychological evals, school evals, laboratory tests, supplement logs, etc. It is another full time job staying on top of what he needs to keep improving his health. Low and behold, as I treated some of these underlying MEDICAL issues, the behaviors we associate with autism began to lessen. ATEC and ADOS scores began to fall. IEP's were no longer filled with talk of autism, as a matter of fact his school records note specific learning disability in certain areas now, not autism. Some may debate that because our diet is still not your "Standard American Diet" (which it will never be again regardless of my son's health status) that he is not "recovered". Some say because we still give him supplements that he is not "recovered". I couldn't care less what anyone's definition of recovery is as long as my child is happy, healthy, thriving and able to navigate this world with less roadblocks. That is how I see my son's diagnosis of autism. He is not autistic, autism is not who he is. Clearly not if he can make so many changes in a relatively short period of time. I know this is touchy and why we need two "camps" is beyond me. I can still love and accept my child despite wanting to optimize his health the best I can. And if that succeeds in a reduction of behaviors that result in a diagnosis of autism, why not?!? I got to sit up on stage at the recent Autism One conference in Chicago beside my Thinking Moms Revolution sisters. I am a member of TEAM TMR, the non profit side of The Thinking Moms Revolution. My son's story was in the 2nd book. I was told that we were the first panel dedicated to autism recovery. Times are changing. Parents are sharing what is working to heal their children. We are the revolution. No longer will we sit and watch more and more children be diagnosed with autism without providing some measure of hope. On this panel we shared our stories and took questions from the audience. There were some similar stories but each child is unique and so our stories also varied. I was so proud to be up there with these brilliant ladies, spreading the word that there is something you can do to help your child with autism. Time and time again, I hear parents complaining that their local physician or practitioner WANTS to help their child with autism and yet doesn't quite have the tools or training to lead them effectively. Quite honestly, that is what made it necessary for my family to drive to the next state to see Dr. Woeller, the lack of truly qualified people who could help me recover my son. But maybe your physician or practitioner is open to learning more, to expanding their skill set to help treat autism more effectively. If that is the case then this course is perfect for them! I believe that more education for our physicians and practitioners on the treatments that actually work for our kids is crucial at this time. The rates of autism have exploded and there is no one-size-fits-all approach when talking biomedical treatment. Please share! And parents, if you are wanting more education for yourselves, Dr. Woeller is opening this up for parents as well! Below is a message from Dr. Woeller about his new course. I am very excited about the release of my upcoming Integrative Medicine for Autism Mastery Course for physicians and other health care practitioners. This is the very first time I have ever put together such a program. Truth is, I have been “working on it” for a number of years, trying to encapsulate my 17+ years of clinical practice into a program that could be understood and implemented in a reasonable time frame. With Autism Mastery, I believe I’ve done just that. And just in time...as autism rates are growing each year, and there simply aren’t enough knowledgable health practitioners to help! This online course will feature clinically relevant, practical, and time efficient material for any health practitioner currently working with the special needs community, or, for those who want to gain knowledge about how to help this underserved population of people. To help families struggling with the complexities of autism, I have created an online, 12 week course that will provide a depth of knowledge regarding biomedical intervention for autism-spectrum disorders that would normally take years of training and practice to obtain. In fact, I wish there would have been a course like this when I was starting as it would have shaved years off my learning curve! While Autism Mastery was created with the health care practitioner in mind, I also know that “autism parents” are some of the most educated and studious people out there, so we will have spots available for dedicated parents as well. My goal is to increase the knowledge base of anyone who is looking to implement biomedical intervention into their practices (or homes) and take their knowledge of integrative health concepts to a deeper level in helping these children. We need to have more educated and knowledgable parents and health practitioners helping kids no matter where they are in the world. We have some promotional webinars scheduled in April regarding this course. I encourage everyone to join me to learn more about my Autism Mastery Course and how biomedical intervention for autism is so crucial in fighting this growing epidemic. Please go to http://Autism.IntegrativeMedicineAcademy.com for more information, to join us, or to sign up for a free, informative webinar. 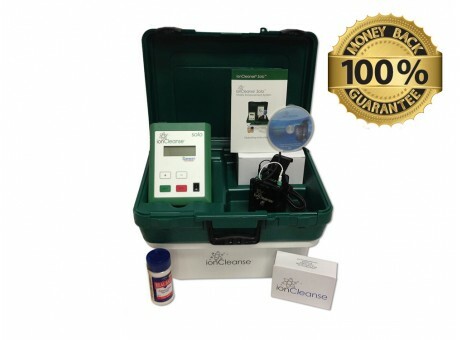 I have shared our experiences with the IonCleanse Foot Bath Detox System. Since the end of December we have seen a pretty dramatic reduction in ATEC scores for my son. He started at 25 and at the end of Feb was down to 9!! Anything under 10 is considered recovered. Our biggest gains have been social and interactions. He is asking age appropriate, scenario related questions, requesting interactions from his sister, and giving us pretty normal 11 year old back talk (if that part wasn't so cool I would be highly irritated). I get asked quite often when I post about the IonCleanse. What is foot bath detox? Is it really effective? What should I see and how quickly? Is this just for autism?? I know there are lots of questions. I had the opportunity to interview Tyler Dahm, Owner of Pathways Natural Wellness Center in Arvada, CO. Not only is she a business owner who uses foot bath detox with her patients but she is a mom of a child recovering from autism. She sees this from the personal and business side and has had a lot of experience in using these units for the betterment of her friends, family, and patients. Don't miss the Detox eConference being put on by The Thinking Moms Revolution tomorrow!! To check out my interview, visit The Thinking Moms Revolution here.